After 24 months and 22k miles I have been extremely happy with the car. I have had no major problems with the car, excluding the recall for the insulation removal. The recall was handled extremely professionally, with VW offering to pay for a rental car, a detail, and pretty much anything else within reason to make me happy. The only small problems I have had are, a defective power window switch, and broken pieces of plastic interior trim (the plastic posts that are supposed to keep the floor mats from slipping). Both of these items will be fixed at my next service. In terms of preformace I have been very satisfied. Was I depressed when I found out I could have gotten the 1.8t if I had waited a year, of course, however the 2.0L has been more that adequate. In terms of the handling I once again have to disagree with the popular opinion that it is a step back from the A3. 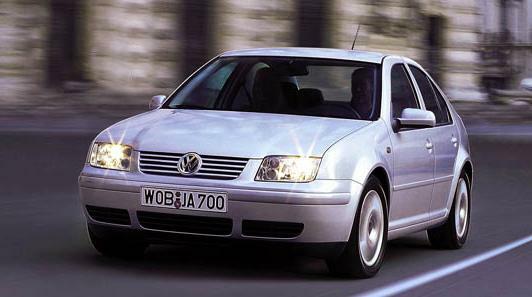 I owned an A3 Jetta (a 1995 GL) and feel the A4 handles as good or better ON THE STOCK TIRES. Tires are one area were I feel VW has made some really poor choices of late. My 1995 had crappy Goodyear Invicta GL's 185/60/14. While the Michelin MXV4's on my 1999 are a vast improvement over the stock Goodyear tires on my 1995, I am not thrilled at having 65 series tires (195/65/15). I expect when I finally get my new 16" wheels and tires the handling will be that much better since the primary problem currently is sidewall flex. 16" TSW VX1 Wheels with Dunlop Sport 8000 tires (205/55/16) or possibly (225/50/16) if they will fit.